Our wonderful Creed now resides in Asheville, NC with his new owner Jim Kelton and will take part in endurance riding. It was bittersweet to see him go, but we are very happy and proud of him. Creed is a Colonial Spanish Mustang. He was born in the wild in May of 2006, north of Corolla. Creed is coming along nicely under saddle. 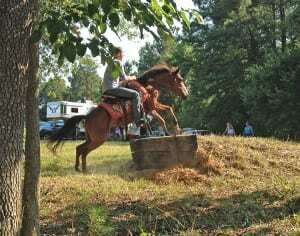 He was trained at Mill Swamp Indian Horses in Virginia, where young riders enjoyed long trail rides with him, and he was praised for his athleticism and endurance. Herd Manager, Christina Boucher-Reynolds rode Creed in a competitive obstacle course challenge in which he performed admirably. Creed stands at 13.3 hands tall and loves people.